What happens when a fairy tale depicting an innocent princess saved by a litany of characters on her way to the crown turns into an epic battle with a heroine in full armor storming the castle herself? Well, we discover just how flimsy a character the titular Snow White actually is. A prisoner for years while an evil queen brought darkness upon her kingdom, the young girl’s escape into the hallucinogenic Dark Forest proves nothing but a sense of survival. She has no skills at war, has never led an army, and possesses no power to rule besides the memory of a compassionate king before her. Instead of accepting the archaically stereotypical feminine weakness instilled by Disney in their adaptation of the Brothers Grimm‘s work, we laugh at a heroic huntsman ruminating on her strength while she lay lifeless and cold. What did she ever do to deserve such praise? Here lies the trouble with Evan Daugherty‘s—and script doctors/assistants John Lee Hancock and Drive scribe Hossein Amini—version of the timeless fairytale Snow White and the Huntsman. We’re supposed to gaze upon the beautiful princess (Kristen Stewart) with inspiration and hope for the downtrodden and enslaved peasants of a kingdom long past its glory days. We’re supposed to rally behind a girl who possesses no skills other than the ability to offer seasoned warriors a wealth of gold she’ll only be able to give if victory is achieved. Even when the man sent to capture her—Chris Hemsworth‘s Huntsman—changes allegiances due to the memory of his deceased wife, she brushes off his teachings on how to slay a charging enemy by saying she wouldn’t have it in her. There goes the warrior Snow White the trailers said we’d find. Promising not to be a ‘fairy tale’, the film retains all the heightened clichés inherent in one and makes all attempts at seriousness comical. The fantastical environment surrounding these dirty, grizzled fighters is so jarring a contrast that their juxtaposition only elicits giggles while the heavy-handed lore mixes with contemporary grit like oil and water. The filmmakers needed to choose one and stick to their guns—I hated Troy, but at least they stayed true to the misguided decision for a world without Gods no matter how implausible. First-time feature film director Rupert Sanders has style and this is a visually gorgeous work soaked in the horror Disney stripped from the Grimms’ original, but the story crumbles under the intrinsic over-the-top romanticism at its core. Making the once jovial dwarves ornery and craggy like in The Lord of the Rings won’t help us forget Snow White is far from Aragorn. Beginning with an overlong prologue to gain footing in this hybridized world, it almost appears the dramatic tone will replace all memory of fantasy and spectacle. Three drops of blood are spilled for a fair princess to be born and an army of shattered glass fights to smuggle evil into town. A maleficent sorceress, Ravenna (Charlize Theron with a football coach mentality of incessant screaming to instill fear) has grabbed hold of her mother’s mystical ways and kept a false beauty alive to deceive men too weak to see past their desires for the flesh. With devoted brother Finn (Sam Spruell) by her side, she takes the castle and imprisons the one girl fate says can be her undoing. It’s Ravenna’s hubris, however, that eventually allows the girl’s escape once discovering Snow White’s beauty has surpassed her own via the magical mirror seen only by her warped mind. Knowing the princess’s youthful heart would give her immortality, the queen sends Finn on a mission of retrieval. Double-crossings occur as men change sides—Hemsworth and Snow White’s childhood love William (Sam Claflin) get swept into the fray—and the fight sprawls beyond the castle’s walls into the mystical Sanctuary long since repressed by Ravenna’s evil. Here the once proud race of dwarves is introduced as a ragtag bunch of misfits splendidly played by Ian McShane, Bob Hoskins, Ray Winstone, Nick Frost, Eddie Marsan, Toby Jones, Johnny Harris, and Brian Gleeson. Forgetting her complete lack of skill and accepting the dwarves’ devotion to her long-dead father, we must then hope a Braveheart-like speech will turn a suicide mission into a David versus Goliath victory of happily ever after that our childhoods still demand be unaltered. Credit Hemsworth, Spruell, and Clafin for giving in to the film’s goal for epic medieval war. Strong and able, they exist inside the hyper-cut battles sprinkled throughout with shades of King Arthur-scale fight showing through. Perhaps the filmmakers should have kept the heroine a victim of circumstance and in need of saving, though, leaving the good versus evil battles more than a means to pit woman against woman for the climactic quarrel. I’m not saying they should have put Ravenna in iron shoes to dance until her death like the original story, but making Snow White a soldier was an ill-conceived maneuver. Her character is bland and uninteresting in comparison to the dwarves and reluctant heroes that surround her. She is but a device to instill ideas of true love and overcoming adversity; do not pretend she is more unless you write her as such. There is at least a wealth of stunning imagery attempting to help us forgive the story’s shortcomings. The faux soldiers made of shattered glass are fantastic, the magically-camouflaged woodland creatures are beautifully constructed and the dwarves recall Labyrinth‘s Hoggle, complete with rather creepy-looking fairies around them. However, aesthetic only goes so far when you can’t invest in the plot propelling it forward. We know certain aspects from the bedtime story need to happen before its conclusion and, frankly, the ways they are incorporated here are uninspired. And while the childlike sensibilities keep it from being a full-fledged, serious adult adventure, the horrifying imagery of a tar-covered and vile Theron composed of malicious ravens makes the threat of nightmares too much for kids. The film simply exists between worlds without ever giving audiences enough to care either way. 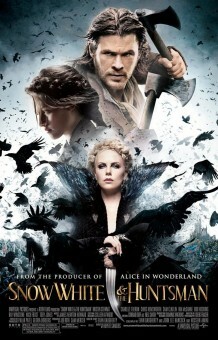 Snow White and the Huntsman hits theaters on Friday, June 1st.